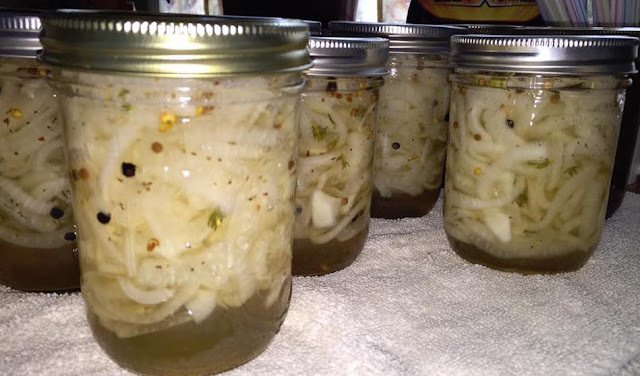 Sweet Pickled Vidalia Onion - Canning Homemade! Shari sent me this Sweet Pickled Visalia Onion recipe and I had to share since who doesn't love Vidalia Onions! Shari's twist on a classic Bread and Butter brine is the perfect way to preserve them. In Shari's combination you use mustard seed as one of the brine spices but you can substitute with a pickling spice mixture instead. Commercial Pickling spice has quite a few additional ingredients such as whole cloves, allspice berries, coriander seeds, cinnamon sticks, and bay leaves which will give the brine a much different flavor. These onions will be delicious on bratwurst, hamburgers, sliders, polish and hot dogs. Thanks Shari for sharing this great recipe! Preparation : Prepare 8 half pints, lids, and rings. Sterilize the jars and keep them in the hot water till its time for processing. Make sure to fill your water bath canner and get the water to a simmer. Cut your onions in half and using a food processor slice the onions thinly or use the shredding blade. If you have a mandolin you could do it on the thin slice or use a knife! Cooking: In a large stainless steel pot bring vinegar and sugar to a simmer till sugar dissolves. Add onions, thyme, celery seed, mustard seed, and dill weed. Simmer for 10 minutes and remove from heat.